The UK cabinet agreed on a soft Brexit, but Boris Johnson’s resignation hit the pound. As time passes by, nobody challenges UK PM Theresa May. The dizzying political drama can turn into a buying opportunity. The resignation of now ex-Foreign Secretary Boris Johnson sparked a sell-off of Sterling. The pair made a total round-trip of some 150 pips on Monday. Apart from the senior job he held, the ex-mayor of London is a prominent figure in the party and a lifetime contender for Prime Minister. Many had thought that with his resignation, he would take another step further and lead an effort to oust Theresa May as PM. As the highest ranking hard-Brexiteer, he can gather fellow Brexiteers around him and enter No. 10. However, as time passes by, the current resident of Downing Street seems more secure in her job. Theresa May made a confident appearance in Parliament and faced down the backbenchers. So far, the hardliners have not reached the needed 48 votes to ignite a leadership challenge. But Johnson will not die for the dying dream. May warned her colleagues that continued internal fighting within the Conservative Government would put Labour Leader Jeremy Corbyn in No. 10. That threat or the lack of support for Johnson in Westminster (contrary to Tory members), may have kept many of them quiet. British politics usually move fast, and without Johnson doing anything, the window of opportunity may be lost for the Brexiteers. Many analysts think that neither Johnson nor anybody else wants to lead Brexit. If May survives this crisis, she comes out stronger. The pro-Remain camp has a bigger say at the table after the departure of her political rivals. Moreover, just on Friday, she delivered a softer stance on Brexit. May wants the EU and the UK to use a common rulebook around customs to avoid a hard border between Northern Ireland, part of the UK, and the Republic of Ireland. A common rulebook and open borders sound precisely like a Customs Union. Looking at the timeline of her premiership, many red lines have become pink, and some have disappeared. Will she also change her stance on the Single Market? The services sector is more significant and more critical for the economy. All in all, the adoption of a softer stane is better for markets. Sterling slumped on the news of Johnson’s resignation as the thought went that the UK government is about to collapse. Such a collapse would either lead to a return to a hard Brexit stance or no deal at all. But if May survives, this is good news for the British currency. The technical picture for the pair quite balanced. It is trading between the 50 and 200 Simple Moving Averages on the 4-hour chart. The Relative Strength Index is steady, and so is Momentum. 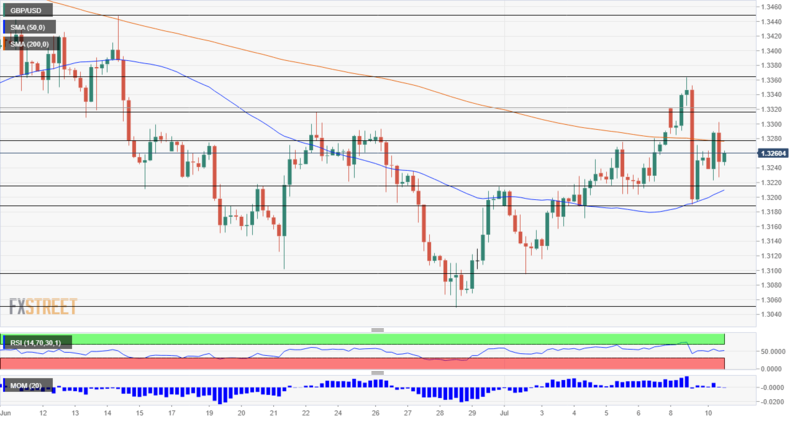 Some resistance awaits at 1.3280 which capped the pair in early July. The June 22nd high of 1.3320 is next. The July 9th high of 1.3365 is the next level to watch, and the mid-June swing peak of 1.3445 is next up. On the downside, we find early July high of 1.3320 followed by 1.3190 which was the July 9th low. Lower, 1.3095 was a swing high in early July and in mid-June. The last line to watch is the 1.3050 trough seen in late June.